Rebecca had worked both abroad and online teaching English for a number of different schools, and now was really wanting to start up her own English lessons service and website. She wanted a place to send new potential clients directly, as well as be able to take payments and have students book class times, all easily online in one place. Rebecca wants for her students to have fun while taking her classes, and so she wanted her site to be the very opposite of the typical, corporate language learning services you'll find online. Rebecca wanted to begin differentiating her lessons from all the others out there with a fun, modern design. We built her site on Maple, one of the templates within the Brine family, my current go-to template family. Once all the site design was completed however, I still had lots more work to do! 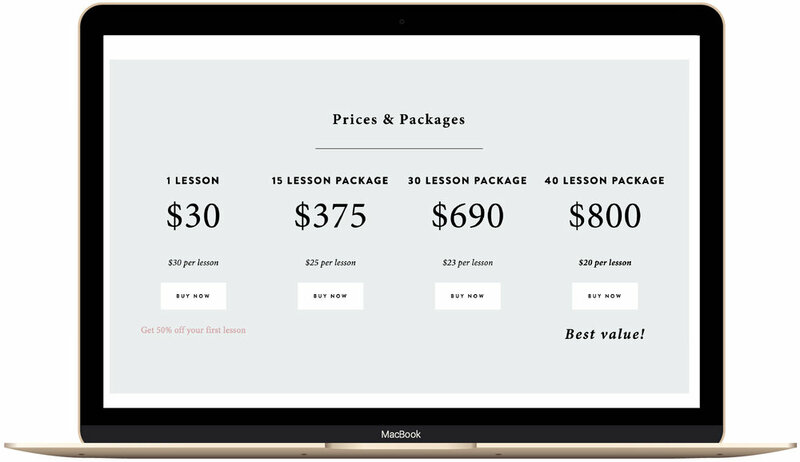 Rebecca's also needed an e-commerce system where she could sell individual lessons, lesson packages, and set up discount codes, so she could offer her first lesson for 50% off. Additionally, we wanted for students to be able to book their lessons all online, so Rebecca wouldn't be spending hours each day coordinating times with her students, especially as that can get pretty complex when taking multiple time zones into account. Acuity Scheduling fit our needs perfectly, and now Rebecca's site works seamlessly with Acuity to sell lessons, lesson packages, help students book their lesson times, and even sends them the link to the online classroom when they book! Rebecca added to the studio's 5 star reviews with these kind words. "Before working with TPS I felt like designing my own website was way too overwhelming. I knew all the details and functionalities that I wanted my site to have, but to get all those little parts working together way way over my head. Now, I'm looking forward to having my entire business online, which enables me to be location independent. I love the fact that I will be able to work from anywhere in the world as long as there's an internet connection. I feel like Paige laid the groundwork down and got me all started, and now my website can grow and develop and take on a life of its own as time goes on." Also looking to get a site and brand you love launched?